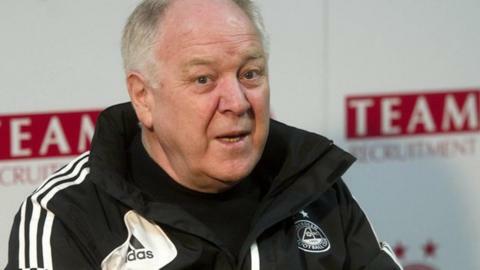 Aberdeen manager Craig Brown insists his side will use the injustice at not being awarded a penalty on Saturday to drive them on against Ross County. In Saturday's match against Kilmarnock keeper Cammy Bell brought down Niall McGinn, but referee Euan Norris booked the striker for diving. Brown believes it will make his players determined to pick up points before the league splits. He also insists his side will "revel in the adversity". Brown felt his side were treated unfairly in Saturday's 1-1 draw with Kilmarnock by after being denied a second-half penalty at Rugby Park. Killie keeper Bell felled McGinn late on, but the striker was booked for simulation and television evidence later backed up Brown's complaint. "I cannot think of an occasion this season when we've had a marginal decision given to us - and that's disappointing," said Brown. "I think every manager will probably say the same because I know that yesterday Hibs were very harshly dealt with. "A penalty was awarded that didn't look to me on television like it was a penalty to Dundee United, so Hibs will be feeling how we're feeling, but on two occasions recently, the cup semi final last year and the cup this year, Hibs got the benefit of decisions against us." The Dons take on Ross County on Tuesday night having lost 2-1 in Dingwall in November. County are now unbeaten in eight league games, and Brown admits he is impressed with their recent prowess. "You usually find that a team comes up with great impetus, but the second season is the more difficult of the two," said Brown. "When teams come up they come up with a winning mentality, they come up with a positive optimism and that gives them a good lever to stay in the top league. "They've come away very well and no-one can dispute the capability of Ross County this season. "We've got five games before the split - one of them is against Celtic - I'm not saying we wont get points against Celtic because St Johnstone proved otherwise, Kilmarnock proved otherwise, but we'll only have four games left. "This match is particularly important because this is at home and against a rival team in a similar position."